Do you remember – how and when the first ideas of making a production of Rameau’s Tragédie lyrique “Hippolyte et Aricie” came into existence? I’ve been badgering them [Aletta Collins and Ólafur Elíasson] about it for years, and having done his last opera, “Les Boréades” in Salzburg in the 1990s, I’ve longed desperately to do Rameau’s first opera, “Hippolyte et Aricie”. I looked for a director who is also a choreographer and can work with large groups together. The list of people I wanted to have as a director was very short, and here she [Aletta Collins] is. To actually do this is very difficult, and when you have productions, as one often does, where there is staging and then dance, the two normally do not marry together. But this the form Lully invented and which Rameau was exploding. As well as Aletta, I have long wanted to work with Ólafur, and when the idea came up, it was decided between Matthias Schulz [the General Manager of Staatsoper Unter den Linden] and me, in a matter of seconds. When we first met, about twelve years ago, Simon and I discussed whether he conducted from the instrument to the ear or from the ear to the instrument. At that time, Simon talked about Mahler and told me that there is a beginning, where you have to play to the ear, and then there is that quiet part, where you have to play from the ear back to the instrument. There is a sort of dialogue and without the presence of the audience, it makes very little sense to play. Maybe this is why the baroque was a breakthrough, because it was so experiential. It allows the audience to be very expressive and very active. I can imagine it is totally exciting for a director and choreographer. How close was the collaboration between you at this very special project, and how long did the working process last, from the first idea to the premiere in a few days? Simon spoke about this to me six years ago, and I said: “Well, I’ve never heard it”. And he said: “You’ll find it hard, because this version [the third and final version from 1757] never has been recorded, but explore it!” So I started gathering a little information. It was going to happen, but at that time, the Staatsoper ran out of money. And thank goodness, because six years ago we maybe wouldn’t have had the courage to go for Olafur. Because at that time, he said: “I am never going to work in an opera house again”, after his only previous experience. But I’ve grown a little more self-confident since then, and in the meantime, I have been involved in several stage works here and there. My inspiration for this project actually came from my time in 1990s Berlin, in the arts and club scenes here. Back then, there was an almost baroque connectivity of disciplines and ephemeral dimensions. Music, dance, light, architecture, situations, conversations, relationships, and even arguments blended together seamlessly to produce a powerful, dreamlike state. The truth is, I am easily moved by dance and music. I have listened very carefully to what Simon was conducting, because for me, great art is often hard work; it is not about leaning-back and passively consuming. So I am very inspired by this collaboration and by the question: how do we reach out to a younger audience? That is a challenge that we are all interested in, encouraging the institution to reach out of their comfort zone. Have you listened to Rameau’s music ever before? Yes. I first started playing his music over 40 years ago and I’ve been crazy about it ever since. For myself I never heard it any before. Until recently it was rare to see a production and it’s still certainly not common in the German speaking countries. People did not realize what a rich scheme of art it is. Although the conventions of the opera of the time mean that he did not use Racine’s ending, the intensity and pitilessness of the original play remain. And the happy ending still implies tragedy for both Thésée and Phèdre. What do you think – which are the special qualities of this special work? Lully had invented this style of a dancing opera, or however you would call it. What Rameau did was to take it into the palms of his hand and then let it explode – to the point where there were violent altercations in Paris between the “Lullysts” and the “Ramists”. They could not believe what was happening to their art form, which had been decorative, but very beautiful in its plain way. But Rameau’s music was like something coming from another solar system in terms of experiment and emotional truth. Our performance offers the third version of “Hippolyte et Aricie” from 1757, that was created 24 years after the first one. Which are the reasons for such a choice? Astonishingly, this version has not been staged in modern times. These were Rameau’s last thoughts on his first opera, where he also had more confidence in what the orchestra could do. This is a much less discursive version than 1733; there is no mythological framework, it is much more dramatic, it is much tighter, and in fact, he even cuts out a little bit too much. He restored the music that he had to cut out from the first version, because the performers could simply not sing and play it. It is important to recognize that there are several versions from which you can choose, but I was fascinated to do his final thoughts, in the beautiful new Bärenreiter edition. There is a lot of interpretive space, which is not an imprecise space, but a more productive, open space. As a layperson, I thought that operas are stiff, old, non-negotiable, solidified monsters from the past. But the generosity with which Aletta and Simon have shared this with me has helped me find a way of approaching this music. Rather than travel back in time to visit this traditional Baroque opera, I wanted to acknowledge the fact that the Baroque has been traveling for several hundred years to meet up with us here today. But wait until you hear the orchestra, because they are really inside this music. The dancers said to me: “Wow, this was like a Flamenco-club”, because they just went for it in the most incredible way. It was like in a little bar last night in that little rehearsal room. Obviously, dancing is dancing, but it is not really: because you can have narrative, very descriptive kind of dancing or you could have something that is more abstract. Often it becomes difficult when dancers try explicitly to become a part of the story, because they are not singing shepherds, they are dancing shepherds, so that means they are not as good as the singing shepherd, because the singing shepherd sings. But in this environment, they are, because they are part of the structure of the whole thing. They can have their own language, that takes them just on a whole new level than just being these little characters. They can become more universal and they become more connected to nature. They are creating their own set as well. I liked Aletta’s approach to addressing the strict distinctions between that the fields we are working in, the compartmentalization of – who does what –: who dances, who sings, where is the stage and what are we looking at. Aletta gives everybody the opportunity to reconsider their potential. That is also something that makes it very contemporary. 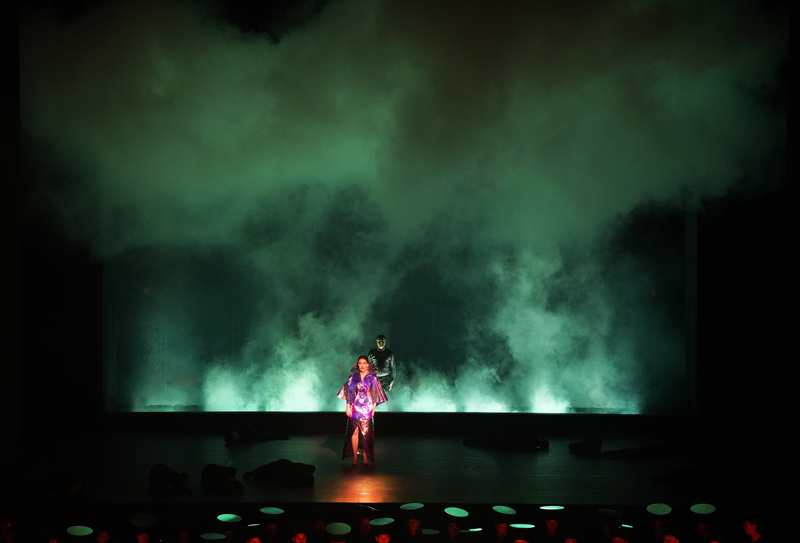 Obviously, the light design plays a prominent role in the production. Does that support the ambition to create – using a term by Richard Wagner – a new “Gesamtkunstwerk”? I think there is a very specific tone in the Wagnerian idea of the “Gesamtkunstwerk”, so I would not use the word here. I think we should generally avoid such a notion of totality. What I have tried to do with the staging here is to create a kind of openness, a humanistic, almost social-democratic, communal space. The lightning tries to support that openness, creating space in the most humble way, because there is no stage set, but there is plenty of space: with a little bit of light you already have plenty of open space for interpretation and, of course, there are a lot of dancers, there is a big choir. This is in no sense a decoration. It is actually the foundation or the fundament of everything we are doing. We are all working together. We are moving from Olafur’s work as much as we are working from Rameau’s. It is a dialogue between the lights, the performers and the music. And because it is a dialogue, there is space for each element, it is very organic, in that sense. Which function does the sphere on the top of the hall have? Ólafur ElíassonOne way to interpret it is that the sphere is an opportunity to think about spherical things, rather than pyramidal things – pyramids being hierarchies, and spheres being communities. Our planet, the atmosphere, and the climate are all spherical. I think that there is something fundamental about spheres, because there is no place on a sphere more important than any other one. Hanging it in the room with the audience and projecting light onto the sphere, so that the reflected light activates both space and audience hint that they too are a stage. But I bet it will make a difference to the acoustic as well, because it is above us. Sound will hit it and reflect. Interestingly, without you knowing it, you’ve given us a stage which really helps to put sound forward. Let’s talk a bit about the dances and the dancers. Aletta, which style or stylistic features are you obligated in your work? I haven’t been slavish at all, I mean, I tried to be, but I read and found out so much about gavottes and I became obsessed about gavottes, thinking I have to know exactly what they are. They are very dull. (Laughs.) Lots of those dances are very simple, so that everybody could do them. The most interesting thing about the gavotte was that people got together as partners and improvised. So it encouraged me to work much more with improvisation and within this, to be free and find out our own language. The rules that we have across time put around these dances and held them so reverentially: a minuet, a gavotte, etc. They were improvised, they were much more fluid, they embraced much – they were also ways people would come closer together and being able to make contact. Those are the things I found more of use, rather than my dictionary of baroque dancing. Do you have a favorite scene or musical piece in our opera? I come home thinking I do, and then the next day I’ve got something else. It’s full of so much beauty. It changes all the time with me. Well, yes. It’s the scene where Phèdre realizes she has caused all this complete disaster and that she is going to have to confess that is all her fault and she will kill herself. The chorus around her tells her what she has done and they keep repeating that Hippolyte is no more. And an earthquake happens, which is her own emotions. It makes me shake to think of it even now, how powerful it is. It’s one of the greatest moments of any baroque music. But there are all kinds of other moments where you melt or you’re excited, because Rameau is the great master of rhythm. All the scenes with Magdalena [Kožená] in them. In your opinion, is Rameau’s “Hippolyte et Aricie” a piece for present time, not only for history? Has it anything to do with our life here and now? Yes, well I do. It’s dealt with something so traumatic and so huge. We go through such trauma and so many challenges. At the end of the day, it’s about listening to what was always there, and with this huge opera to end with somebody saying: “Listen, I can hear a bird singing.” The humanity, and also the spirit of somebody – Aricie – to journey through the challenges she journeys through and for her to end and to be able to hear that bird. For me, that’s the thing that first excited me: the idea that something was around us in nature because of ones experience in that moment you’re not aware of. But the awakening and the opening of one’s eyes: you see what was always there when Aricie begins to tell us about the nature that’s around her. Aricie has just seen her entire family murdered. She’s the last member of this family. She is basically stuck as a kind of half slave, in one of the most dysfunctional families in all of theater. The family dynamic shown is incredibly complex. The relevance and presence of a great work of art has to do with its ability to simply touch you and make you aware of having been touched and of existing. Great artists like Aletta and Simon are able to touch people at a time where being touched is actually hard, where we are systematically made numb by the constant onslaught of information, data and experience. Aletta makes me aware that I have a body, and Simon makes me aware that I can hear. It allows me to look at the stage and say: “I know this feeling. This is me on the stage. This is how I sound. I am also important in this world.” And I leave with this feeling that I have something to give to the world as a very generous opportunity – this, I think, makes a work of art contemporary. Many thanks for the conversation – and good luck for the final rehearsals, the premiere and the subsequent performances.